Who knew that balls hated cubes? Violent Ball gives you the task of using balls of varying sizes and weight to push and knockdown elaborate stacks of cubes. Watch the chaos and get as close to the score as possible. 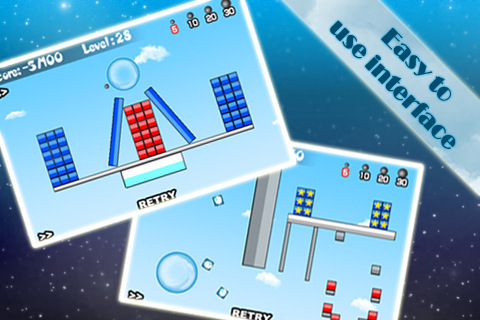 Developed by Poqop, Violent Ball is available on the iPhone, iPod touch, and iPad for $1.99. Graphically, there isn’t much to comment on for this game. You have a very nice sphere that you shoot from, but the cubes, sky background, and the text choices for the interface are lacking. Theme wise, there isn’t much coherence, but it would have been possible. I could easily imagine the entire game looking similar to the mother-sphere thing. The way you play this game is by sliding your finger across the mother-sphere, which creates a new ball. You increase the strength of your shot by dragging your finger further and the shot will fire in the opposite direction that you drag your finger. You have 4 different balls you can shoot, each costing a specific amount of points from your total score. The higher you pay, the stronger and heavier the ball will be. 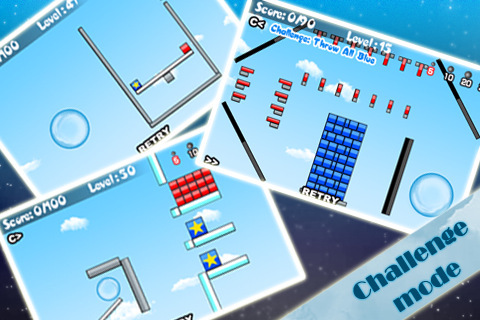 Using the minimal amount of balls to knock down each cube tower is required to make sure your score meets the minimum requirement and spamming your shots will result in a negative score or an extremely low score since you only get a set amount of points for knocking down those cubes. ViolentBall’s levels are a mixed bag. You have some extremely well done levels with fun challenges similar to Angry Birds, but I swear there are some levels that are just too hard to pass. As the puzzles get more complicated and you get new challenges such as balloon cubes that float upwards, bombs, or black holes (and revelations), the game’s design does get better and more interesting without being harshly unfair like the first 5-10 levels. The pacing is a bit too challenging, but the game’s design improves in later stages. The art could use some work and maybe a coherent theme, but overall, ViolentBall is an interesting game with some strong moments. It would be nice to be able to move the mother sphere so I can shoot those nearly impossible. Also, despite the game itself, there seems to be a save issue where you always start over when you start the app. I didn’t notice it immediately since I played this game in mostly one session, but when I came back the next day, I was back to level 1-5 and considering that those were the hardest that I had to complete, I was not happy. ViolentBall is an average app at best and nothing stands out besides the save issue and level 5, which I hate with a passion. AppSafari review of ViolentBall was written by Joseph Ho on November 24th, 2010 and categorized under App Store, Games, Physics Based, Puzzler. Page viewed 2919 times, 1 so far today. Need help on using these apps? Please read the Help Page.